Opti-Lean Whey bar is high in fibre and low in sugars, they help support lean muscle growth & maintenance with added ingredients; CLA, L-Carnitine & Green tea. Each bar is 53g. Whey Protein Concentrate (Milk) (15%) (Emulsifier: Soy Lecithin), Milk Proteins, Dark Chocolate Flavour Coating (14%) (Sweeteners: Isomalt, Sucralose; Non-Hydrogenated Palm and Palm Kernel Oil, Fat-Reduced Cocoa Powder, Emulsifiers: Soy Lecithin, E476), Hydrolysed Collagen, Humectant (Glycerol), Fructooligosaccharides, Sweetener (Maltitol Syrup), Water, Soy Protein Crisp (Soy Protein, Tapioca Starch, Salt), Safflower Oil with Conjugated Linoleic Acid (CLA) (Milk), Fat-Reduced Cocoa Powder, L-Carnitine, Flavourings, Green Tea Extract (Camellia sinensis, leaf), Colour (E150c), Antioxidant (Natural Mixed Tocopherols). To be used in the framework of a varied and balanced diet and a healthy lifestyle. Excessive consumption may cause laxative effects. 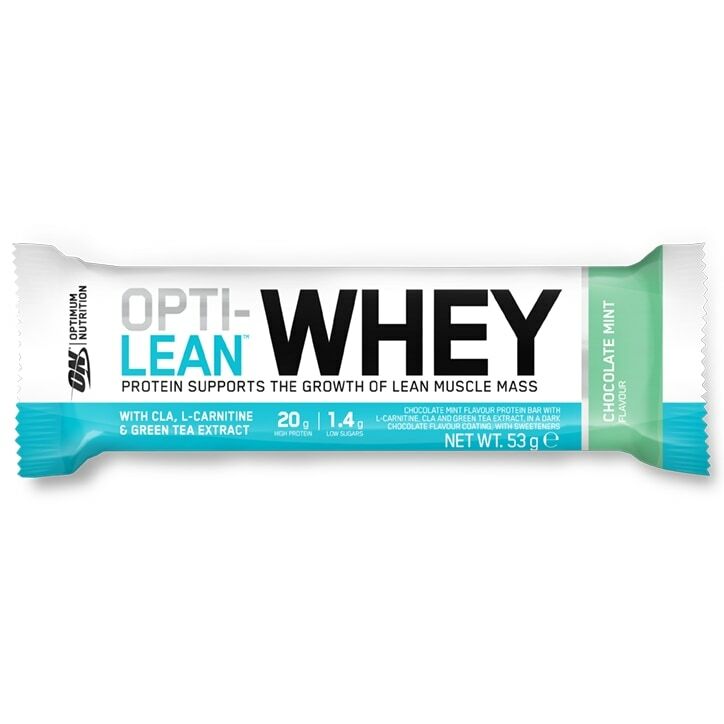 Optimum Nutrition Opti-Lean Whey Bar Chocolate Mint is rated 3.0 out of 5 by 1.